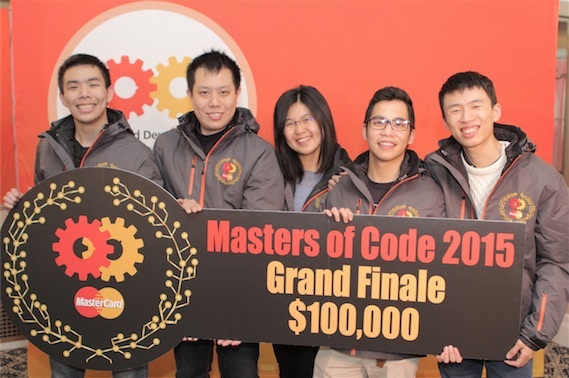 Purchase, NY – December 09, 2015 – MasterCard today announced MoneyRemaid as the winner of its inaugural MasterCard Masters of Code™ global hackathon competition. Competing December 5-6 in San Francisco against the winning teams from each of the 12 regional events held throughout the year, MoneyRemaid earned the title of Masters of Code by building a software platform to disrupt the way domestic workers in Southeast Asia could receive and manage their salaries. The team, comprised of a young woman and four young men, was awarded the grand prize of $100,000 seed funding, incubation in the MasterCard StartPath program, six months of executive mentoring and free payment processing for up to $250,000 in transactions for the first 12 months using Simplify Commerce. The goal of team MoneyRemaid was to drive financial literacy and inclusion in their home country of Malaysia, focusing on the more than 300,000 migrant domestic workers struggling with a lack of financial access, high remittance costs when sending money home to their families, and a trend of non-payment by employers. Using the MasterCard Simplify Commerce and MoneySend APIs, the team created a Software as a Service (SaaS) platform to automate salaries and payments, aggregate remittances to lower their overall costs, and open up safe investment opportunities with improved interest rates for the workers. Leading up to the Grand Finale, the MasterCard Masters of Code competition visited 12 cities around the globe, hosting regional weekend-long events that brought together more than 3,000 of the world’s top developers, designers and entrepreneurs to take on the APIs supplied by MasterCard. Using these APIs, developers had access to unsurpassed assets, data and products from MasterCard focused on driving the next generation of commerce solutions. For more information about the MasterCard Masters of Code competition including rules, judging criteria, prizes, etc., please visit www.MastersofCode.com. MasterCard, www.mastercard.com, is a technology company in the global payments industry. We operate the world’s fastest payments processing network, connecting consumers, financial institutions, merchants, governments and businesses in more than 210 countries and territories. MasterCard’s products and solutions make everyday commerce activities – such as shopping, traveling, running a business and managing finances – easier, more secure and more efficient for everyone. Subscribe for a weekly or monthly newsletter – use the Subscribe link on upper left side menu. No spam, ever.